Affectionately known as "Pixies," two National Instruments PXI units will be put into use by Sonoma State University students right away thanks to donation to the engineering science department. "I can definitely use them with what I'm working on now," said SSU student Jon Porrazzo, who is designing RF antennae. Sonoma State University's engineering science department has received a donation of $20,000 worth of equipment from National Instruments. The new equipment will be particularly useful in lab classes, which the department is focusing on increasing. 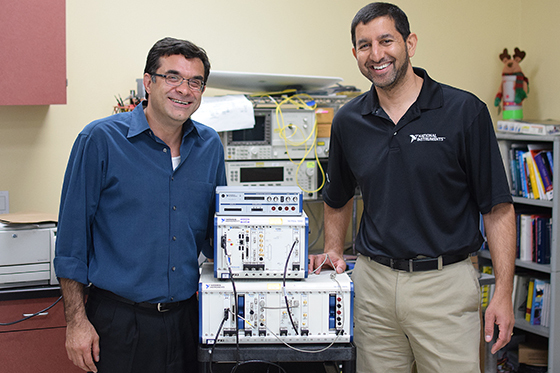 "It's like having all your testing equipment in one chassis," said Jin Bains, vice president of research and development for National Instruments. The equipment also includes special software to analyze and present testing data. The new units are more compact and versatile than similar equipment already in use in SSU's engineering science lab. National Instruments also donated a brand new product, a virtual workbench unit about the size of a modem, replacing gear that would normally take up about four times as much space. "What's cool about this is students get hands-on experience with the same things they will see on the job," said Porrazzo. National Instruments is headquartered in Austin, Texas and has offices across the globe, including one in Santa Rosa. The company is part of the school's Engineering Industry Advisory Board.